2 How Many Calories Are in a Slice of Swiss Cheese? Calcium is one of the most abundant and important minerals in the body. It is necessary for muscle contraction, blood clotting, nerve transmission, and bone and teeth formation. Most adults require between 1,000 and 1,300 milligrams of calcium per day. Certain foods naturally contain calcium, while others are fortified with it. Consume a variety of calcium-rich foods to meet your needs. Dairy products, including milk, yogurt and cheese, are good sources of calcium. One cup of milk or buttermilk contains 300 milligrams of calcium. Yogurt contains approximately 450 milligrams of calcium per cup. 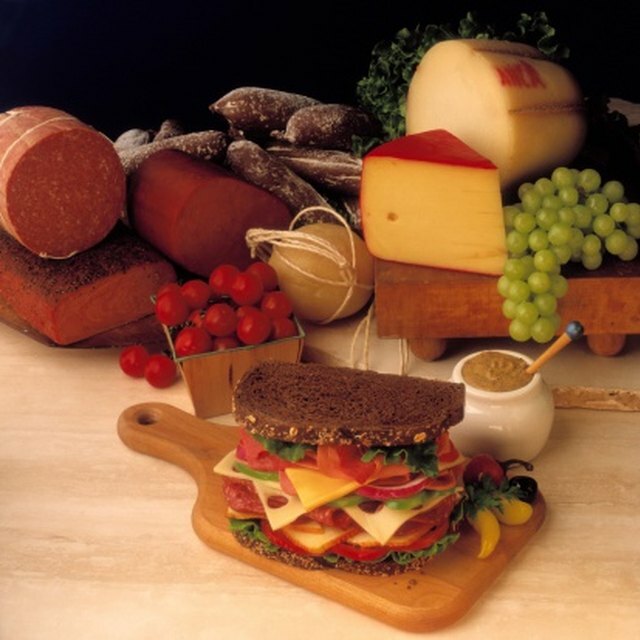 One ounce of hard cheese, such as cheddar or Jack, or 1 ounce of mozzarella cheese contains 200 milligrams of calcium. While 1 ounce of Swiss or Gruyere cheese contains 270 milligrams, 1 ounce of Brie contains only 50 milligrams of calcium. One tablespoon of Parmesan cheese contains 70 milligrams of calcium. Depending on the brand, 1 cup of soy milk contains between 200 and 400 milligrams. Fish, leafy greens and certain nuts and seeds contain calcium as well. Three ounces of canned sardines or mackerel contains 370 and 250 milligrams of calcium, respectively. Three ounces of canned salmon with bones contains 170 to 210 milligrams. While 1 cup of cooked broccoli contains 180 milligrams, 1 cup of raw arugula contains 125 milligrams of calcium. One ounce of sesame seeds contains 280 milligrams of calcium.